The Helen Drake Invitational Tennis Tournament, one of the biggest USPTA draws in the state of Florida, returns to TOPS'L Beach & Racquet Resort for its 28th season. ResortQuest offers 10 percent off accommodations at TOPS'L resort condos for registered competitors. This April TOPS'L Beach and Racquet Resort, which is professionally managed by ResortQuest® by Wyndham Vacation Rentals, will once again welcome the Helen Drake Invitational Tennis Tournament. Historically one of the largest draws in the state of Florida, organizers of this sanctioned United States Tennis Association (USTA) event anticipate hundreds of competitors from across the southeastern United States will participate in the tournament's 28th season. As the proud host of the Helen Drake Invitational again this year, ResortQuest is offering 10% off a three-night stay for registered tournament players at resort condos in TOPS'L Beach Manor, TOPS'L Tides, TOPS'L Summit, TOPS'L Tennis Village and TOPS'L Captiva. This special rate is available from the beginning of the tournament on Wednesday, April 13, through its close on Sunday, April 17, 2011. Situated on 52 acres in Destin, Fla., and bordered by both the Gulf of Mexico and a tranquil nature preserve, TOPS'L Beach & Racquet Resort is renowned as a top tennis destination year round. Tennis Magazine has named TOPS'L among the "Top 50 Tennis Resorts in the U.S." every year since 1987. Tennis Resorts Online, http://tennisresortsonline.com, rated it a "Gold Medal Resort" for 2010, designating it as one of the 10 best tennis resorts in the world. Tournament Director for the Helen Drake Invitational, Joe D'Aleo, also serves as the District 1 President of the USPTA and heads the team of professionally certified tennis instructors on staff at TOPS'L. The Tennis Desk at the TOPS'L Club offers player-matching services, round robins, tennis clinics, and private and group lessons. Resort guests enjoy complimentary use of 12 newly resurfaced Rubico clay courts, including 10 that are lighted for night play. "The popularity of the Helen Drake Invitational is a testament to the quality of the tennis program at TOPS'L and the high level of importance our professionals place on the game," says Cheryl Spezia, vice president of marketing for ResortQuest. "Joe has run this tournament for more than a decade, and it is evident that his dedication and passion for the game is shared by all the TOPS'L tennis professionals." To take advantage of ResortQuest's Helen Drake lodging discount, guests should call 1-800-380-4808 and mention Promo Code A3030. Availability is limited, and reservation must be booked by phone. 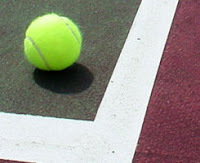 More details, including terms and conditions, are available online at www.ResortQuestDestinVacations.com/helen-drake-tennis-tournament.htm.